Seven network owner Kerry Stokes' leading role in the break down of James Packer's engagement to Mariah Carey has been revealed - causing the pop star to accuse Mr Stokes of kidnapping. Mr Stokes took charge of his friend's private affairs in 2016 as Mr Packer's life spiralled out of control due to extreme debts related to his Crown Resorts business. 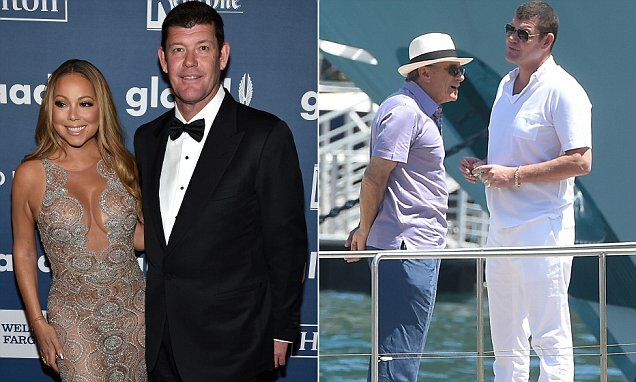 Mr Packer admitted to being manic, paranoid and stressed after facing a $362million tax bill, borrowing $500m to conclude part of his family fortune with his sister and slumping Crown shares. Soon after the billionaire received a call from another friend at his home in Aspen telling him to trust in Mr Stokes, subsequently putting a wedge between the famous couple. Mr Stokes said Mr Packer was 'confused' before his looming wedding to Carey in March 2016. Mr Stokes said he worried about the couple's lifestyle and was forced to turn down a request from Carey to spend $250,000 on her wedding dress. Another request from Carey to charter a plane from Las Vegas to Israel was also denied - angering the star and her personal assistant Stella Bulochnikov. 'I was accused of separating the lovebirds,' Mr Stokes said in The Price of Fortune, Mr Packer's biography, The Australian reported.